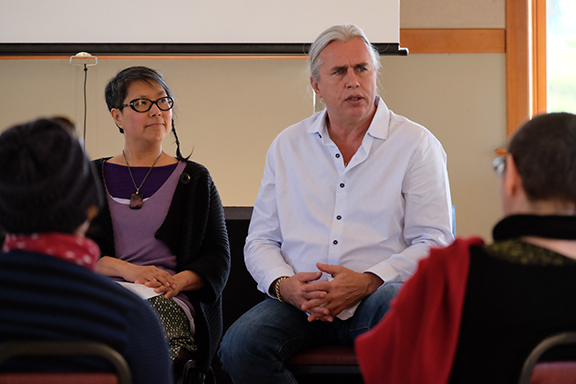 A few photos from the Spring 2019 MFA in Interdisciplinary Arts at Goddard College, with special thanks to guest artist Ron Johnson (Makah) for his generosity guiding us in uncolonial ways; to guests Celeste Dybeck (Jamestown S'Klallam) and Jo Blair, co-coordinators of the Native Connections Action Group, for showing us the Chetzemoka Trail Walk; and to our vibrant MFA in Interdisciplinary Arts (MFAIA-WA) community of wonderful students, alumni, staff and faculty at Fort Worden, Port Townsend, WA! Our semester begins! How are artists claiming space to centre land and bodies that various structural forces have attempted to erase from the public realm and imagination? Panelists will explore ways artists working in the public realm reinscribe land and bodies whose stories have been displaced by systemic forces of colonialism and racism. The Creative City Strategy symposium was a remarkable day that offered many learnings. Thank you to our Musqueam, Squamish and Tsleil-Waututh hosts, staff at Vancouver Civic Theatres, panelists, interpreters, artists, videographers, graphic recorders, facilitators and participants for making the symposium possible. This symposium is a significant component in the development of the Creative City Strategy, a culture plan to guide the City of Vancouver’s efforts to support art, culture and creative work and life. 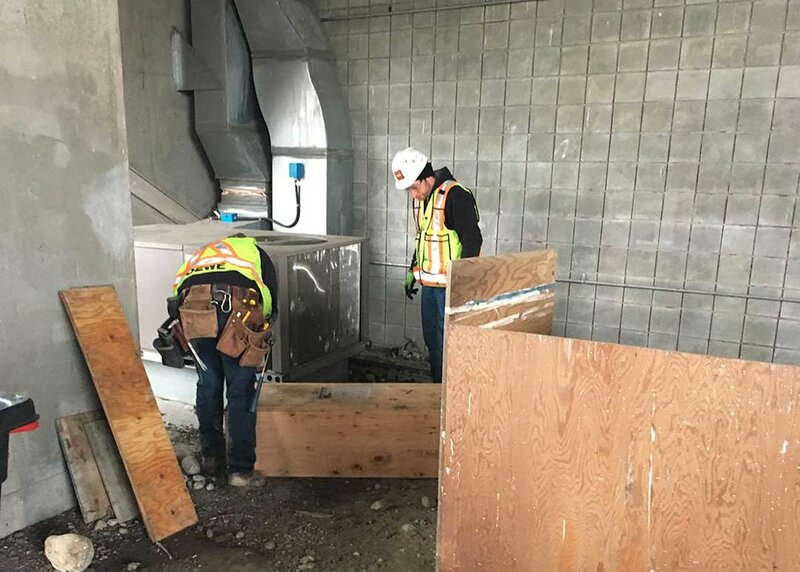 Coming in the Spring of 2019 to the 22nd Street Skytrain Station Bus Exchange in New Westminster, BC. Onsite installation has begun! Keep posted for upcoming news here. Many thanks to Gregory Elgstrand for his article on Artists-in-Residence at UBC, featuring Holly Schmidt and also my recent work with the Earth Ocean and Atmospheric Sciences EOAS, UBC — Special thanks to Tara Ivanochko, Hannah Avenant, Isabel Jankowski, Lvtairan Chen, Eli Braunstein, and Dorothy Yan at EOAS, along with deep appreciations to Barbara Cole, Curator of Outdoor Art at UBC. Join us for a symposium to share the results of the Ten Different Things series. Artists Colleen Brown, Instant Coffee, Laiwan, Khan Lee, Holly Schmidt, Henry Tsang, Janet Wang, Casey Wei, Jen Weih, and Denise Holland and Pongsakorn Yananissorn will give short presentations about their work and findings to be followed by lunch and an afternoon panel. Mobile Barnacle City was mentioned in Vancouver Chinatown Today news! Thanks Louis Lapprend. 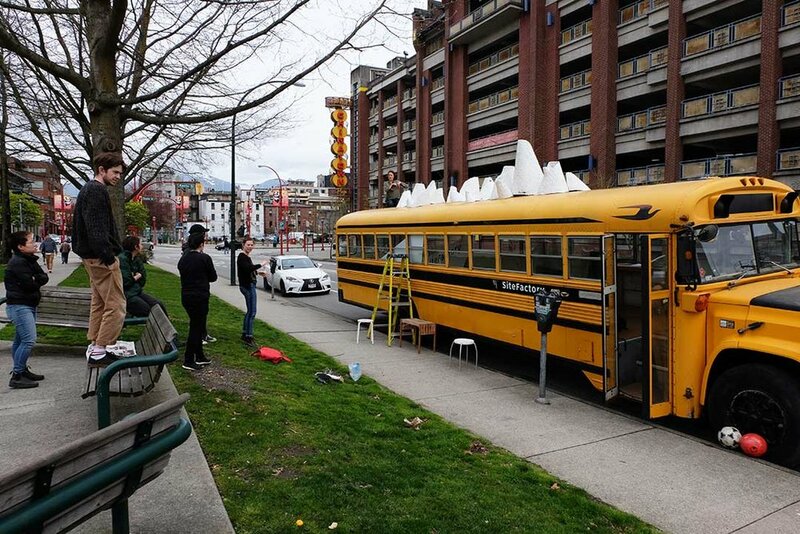 My upcoming project Mobile Barnacle City Live/Work Studio is a temporary site-specific installation at the intersection of Keefer and Columbia Streets in Chinatown, Vancouver, with SiteFactory / Leah Weinstein, featuring barnacle sculptures by Emilie Grace Lavoie. Installation runs from April 15-29, 2018. Located within the SiteFactory bus at a contentious site of ecological transformation, historical and cultural significance, and development pressure, Mobile Barnacle City Live/Work Studio examines conditions of displacement and disparity where Chinatown meets North-East False Creek. The intersection of Keefer and Columbia Streets points to where water of False Creek used to flow under the Georgia Viaduct reaching up to the Sun Yat Sun Gardens, now covered by Andy Livingstone Park and the surrounding development. Over the course of two weeks Mobile Barnacle City Live/Work Studio will be hosting FREE open salons with refreshments including: "Luq’luq’i : a herbal lounge" with T’uy’t’tanat - Cease Wyss & Anne Riley. Thanks for additional sponsorship from Artspeak Gallery, Vancouver, the East End Food Co-op, and support from the Goddard College Faculty Development Fund, Plainfield, VT. Mobile Barnacle City Live/Work Studio is part of Ten Different Things. Curated by Kate Armstrong, the series is a collaboration between CityStudio Vancouver, and Living Labs at Emily Carr University of Art + Design, and supported by the City of Vancouver Public Art Program. It features new commissions launching Spring 2018 in Vancouver where artists were invited to create new works in the spirit of free inquiry at the intersection of public art, community engagement, and civic process. Projects are temporary and take a variety of forms—events, installations, residencies, interventions, workshops—and provoke new visions of art and civic life. How can we create structures, processes or dynamics to produce new ways of living in, interacting with, or occupying the city? Where are the intersections in public life where artists can produce alternate outcomes? Artists: Colleen Brown, Instant Coffee, Laiwan, Khan Lee, Holly Schmidt, Henry Tsang, Janet Wang, Casey Wei, Jen Weih, and Denise Holland and Pongsakorn Yananissorn. Find more information about upcoming Ten Different Things events on Facebook. Images: December 2017 presentations by the directed studies students in our work together at EOAS, UBC. We are into a new semester and I continue to work as artist-in-residence with the research materials generously developed by directed studies students — Hannah Avenant, Elias Braunstein, Lutairan Chen, Isabel Jankowski, Katarina Kusa, Dorothy Yan — led by Dr Tara Ivanochko and assisted by Dr Michael Lipsen at UBC's Department of Earth, Ocean & Atmospheric Sciences (EOAS). It is exciting to be working in collaboration with Dr Ivanochko as we continue to engage in art - science exchanges toward the public art project slated for Fall 2018. Stay tuned for more to come soon. At the opening reception for “Beginning with the Seventies: GLUT” at the Morris and Helen Belkin Gallery, UBC, with Assistant Director Lorna Brown, Director of grunt gallery Glenn Alteen, and artist Anne Riley. Many thanks to Lorna Brown and the Belkin Gallery, UBC, for including my works in this fascinating exhibition that worthily revisits the significance of reading and rereading within the archives. Installed are an early version of she who had scanned the flower of the world... (1987+) , along with drawing collages The Senseless Series: Treasure Island and The Heartless Series: Little Women (1996), along with the assemblage The Blind Heart: A Book Fan (1996). All live in the Belkin Gallery collection. Thanks also to Owen Sopotiuk and the Belkin Gallery preparators for the lovely install. Sorry I was away for the big ECU new campus reveal and the reception for the Alumni Art show "88 Artists from 88 Years | An Alumni Retrospective". For those of you wondering what those two small slide mounts on the wall are — either was submitted to accompany a giclee print, one for the surface scan and one for the transparency scan for each slide. For your curiosity here are the images. They are from the ongoing project she who had scanned the flower of the world... I couldn't imagine how 88 artists would be fitted into the new concourse. Nevertheless, thanks and acknowledgements to the organizers Jonathan Middleton, Cate Rimmer, and Chelsea Yuill, with Susanna Browne and Kathy Slade for putting the show together. And BIG thanks to the gardener, Steve Bridger, who submitted this set of original flowers for my ongoing giclee print series. Thanks also to Goddard College Faculty Development Funds for financial assistance toward the printing of the giclee series. I am also pleased that for the first time, I am in a show with my nephew Tom Chung, also an ECU alum. We should try to show together more often, Tom! 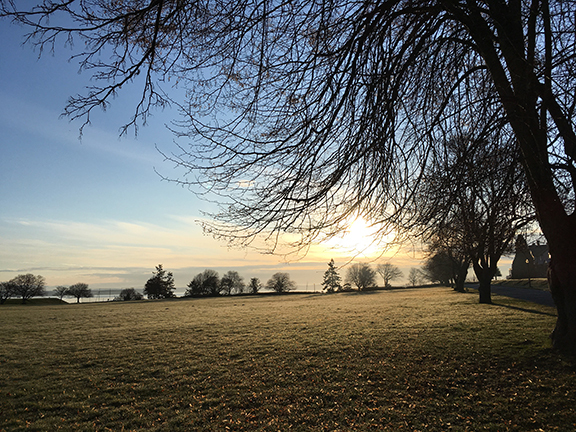 Laiwan is developing a public art project, working in collaboration with the Department of Earth, Ocean & Atmospheric Sciences (EOAS) directed studies students at the University of British Columbia led by Dr. Tara Ivanochko, Director of Environmental Science. Laiwan will be researching interdisciplinary approaches and opportunities to bridge the arts and sciences with the EOAS starting September 2017 until May 2018. More information to come soon. As one of the largest and most diverse Earth science departments in the world, UBC’s Department of Earth, Ocean & Atmospheric Sciences (EOAS) is an international leader in both research and teaching innovation. EOAS researchers together with undergraduate and graduate students investigate processes happening at Earth’s surface, within its interior, atmosphere, and ocean, as well as processes happening on other terrestrial planets. EOAS instructors utilize cutting-edge, evidence-based pedagogy in the classroom, spearheading the University-wide initiative to improve undergraduate science education. The department’s main outreach hub, the Pacific Museum of Earth, showcases EOAS’s commitment to engage and educate the public on a myriad of Earth science phenomena. Thanks Jen Weih, Barbara Cole and Other Sights for inviting me to present alongside with Will Plowright for the Foreshore series. I loved the interdisciplinary expansiveness of the programming and the resulting discussions, and big thanks to the friendly and engaged audience! Till again soon. 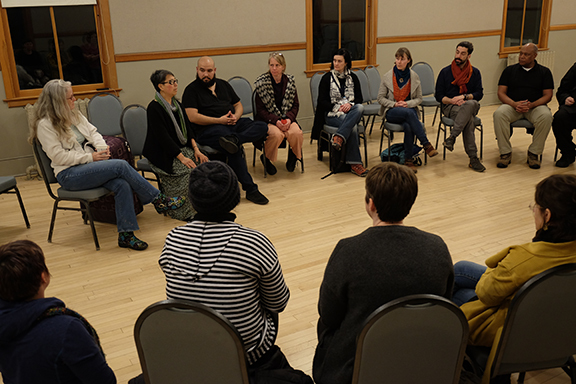 As a faculty member of the Goddard College MFA in Interdisciplinary Arts, I had the pleasure to learn collectively with our community and our Spring 2017 Residency Guest Artists Cease Wyss (Ceremonial Activist, artist and member of Idle No More) and Patrisse Cullors (artist, activist, and Black Live Matter Co-founder) in March at Fort Worden, Port Townsend, WA. Cease and Patrisse worked with us for a week exploring the Residency theme "What is Enough and When Enough is Enough: Contemporary Activism, Well-Being and the Practice of Art". A rich and nourishing week it was! Thanks Cease and Patrisse! This course examines how to expand perception and consciousness for artistic practice informed by contemporary conditions in the world. Shifting away from bracketed thinking that evolved through Cartesian philosophy, this course will instead guide and nurture skills in how to discover an embodied abundance in the world rooted in a practice of deep listening to phenomena. How do we develop sustainable and resilient practices in perception and consciousness aware of abundance and affective dynamics, rather than be propelled by dominating systems rooted in scarcity and panic? Tentacular thinking is a term used by Donna Haraway in her latest book “Staying With The Trouble: Making Kin in the Chthulucene”. This course develops practices that investigate valuable proposals in creatively approaching the ‘trouble’ we face with agility, responsibility, and new possibility. Thank you to the fabulous class of students for courageously participating in our experiments preparing for the Chthulucene. In the spirit of unconventional art practices — always bring your wind-up flash-light to help out as the sun goes down on the bus, SiteFactory: Mobile Art Platform, with Leah Weinstein. Thanks Joni Low for the photo. The wondrous view from my seat on the SiteFactory: Mobile Art Platform's bus, with artists talks by prOphecy sun, Jay White, and readings by Kristoff Steinruck and myself. It was a lot of fun, I liked sitting in the bus amid the changing evening sky, listening to thoughts on art and practice. Look out for SiteFactory's forthcoming Indiegogo campaign that will help pay for installing a solar electricity supply — because yes, we did run out of juice for the projector with the small generator. Nevertheless, I loved sitting in the dark dusk of evening light and the beautiful city sky. Thanks to the attentive and engaged audience who came out to find the bus and to Leah Weinstein for SiteFactory: Mobile Art Platform. Join us for our first public event, an evening of artist talks with Vancouver artists: prOphecy sun, Jay White, Kristoff Steinruck, and Laiwan. SiteFactory's bus location is noted below. prOphecy sun is a Vancouver–based sound artist, performance artist, and media artist, whose work involves sound and movement in live performance, video and video installation. Her interdisciplinary performance practice threads together both conscious and unconscious choreographies, sound, and environment, to create exploratory works that invoke deep body memory and draw from an interior landscape of dreams. Jay White's work is distributed and translated through oral tellings, multi-media installations, and virtual archives. Through performances and objects, remote or unseen areas become shared spaces, and people become implicated in reciprocal and embodied relations with the animate entities that surround them. Jay's work has shown worldwide and his films have won various awards internationally. He is sessional faculty at Emily Carr University of Art + Design. Kristoff Steinruck's artistic practice integrates installation, video, sculpture, photography, and performance. His work is influenced by an interest in nature and science, speculative fiction, film, and conceptual art. Based in Vancouver, his current artistic research is focused on technology obsolescence, mycology, and non-human subjectivity through the production of film and video works. Laiwan is a Vancouver based interdisciplinary artist, writer and educator with a wide-ranging practice based in poetics and philosophy. Born in Zimbabwe of Chinese parents, her family immigrated to Canada in 1977 to leave the war in Rhodesia. Since 2000, Laiwan has been investigating embodiment through performativity, audio, music, improvisation, and varieties of media, along with bodily and emotional intelligence, so as to unravel and engage presence. Recent public commissions have also enabled her to focus on issues of urban development touching on poetic and philosophic themes related to current issues of the environment and built cityscape of Vancouver. She teaches at the MFA in Interdisciplinary Art Program, Goddard College, USA. Location will depend on available parking on Friday July 8th. Earl Finning Way (also called Earl Finning Pl), parallel to Great Northern Way, one street north, between Fraser St and Foley St, just east of the new Emily Carr University site.